You are buying Abbott Similac Sensitive For Spit Up 1.45 lbs. Powder Each, model #53729. ADW Diabetes offers a complete line of baby formula both in liquid and powder form. 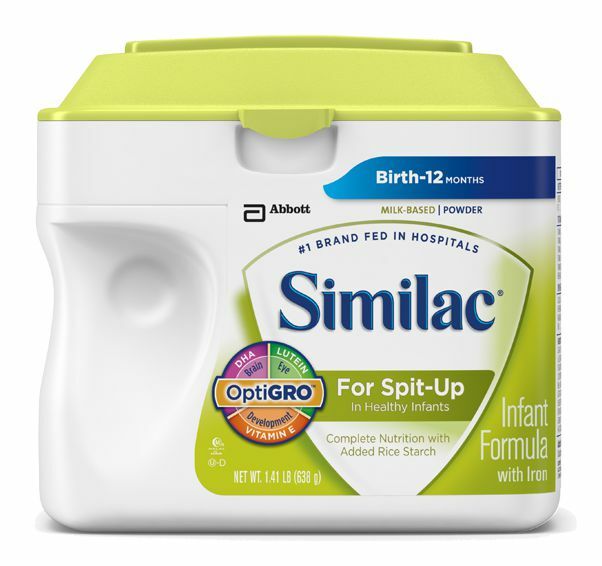 The Abbott Similac Sensitive For Spit Up 1.45 lbs. Powder provides the balance of protein, minerals, and other nutrients that helps give babies a strong start in life. With a well-documented heritage of innovation, Similac formulas have been developed with leading scientists and more than 280 clinical studies. Abbott Similac Sensitive is a nutritionally complete, milk-based formula with added rice starch to help reduce frequent spit up. Milk-based, reduced-lactose formula suitable for lactose sensitivity. OptiGRO is our exclusive blend of DHA, lutein and vitamin E: these important ingredients are found in breastmilk. Easy to digest milk-based, reduced lactose formula with added rice starch. Clinically shown to reduce frequent spit up in healthy babies by 54%. Clinically shown to support normal infant growth. Reduced lactose formulation suitable for infants with lactose sensitivity. Not for use by infants or children with galactosemia. Corn Syrup, Modified Rice Starch, Milk Protein Isolate, High Oleic Safflower Oil, Sugar, Soy Oil, Coconut Oil, Galactooligosaccharides. Less than 2% of the Following: C. Cohnii Oil, M. Alpina Oil, Beta-Carotene, Lutein, Lycopene, Calcium Phosphate, Potassium Citrate, Potassium Chloride, Potassium Phosphate, Calcium Carbonate, Magnesium Chloride, Ascorbic Acid, Choline Chloride, L-Cystine Dihydrochloride, Ascorbyl Palmitate, Salt, Ferrous Sulfate, Choline Bitartrate, Taurine, m-Inositol, Mixed Tocopherols, Zinc Sulfate, L-Carnitine, Niacinamide, d-Alpha-Tocopheryl Acetate, Calcium Pantothenate, Vitamin A Palmitate, Cupric Sulfate, Thiamine Chloride Hydrochloride, Riboflavin, Pyridoxine Hydrochloride, Folic Acid, Potassium Iodide, Phylloquinone, Biotin, Sodium Selenate, Vitamin D3, Cyanocobalamin, Potassium Hydroxide, and Nucleotides (Adenosine 5'-Monophosphate, Cytidine 5'-Monophosphate, Disodium Guanosine 5'-Monophosphate, Disodium Uridine 5'-Monophosphate). *Nutrient values are applicable when prepared as directed.